The Village of Paulding, Ohio is a warm and welcoming community of almost 3,600 residents and the county seat of Paulding County, Ohio. At the heart of the village you will find the historic county courthouse in the center of lush green lawn, complete with an old-fashioned gazebo. The courthouse is surrounded by a traditional "town square" with quaint shops and family restaurants, as well as financial, insurance, legal businesses and non-profit organizations. The Village of Paulding hosts fun, family-friendly fairs and festivals throughout the year. 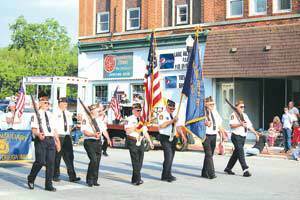 John Paulding Days, held in June, is kicked off with an old-fashioned hometown parade. Thousands of visitors line the downtown square to watch marching bands, floats, firetrucks and all that makes a small town parade great, pass by. Homemade ice cream, chicken dinners, cotton candy, carnival rides and fun, safe events provide three days of fun for families. Around the corner and just outside the village you"ll find Paulding County Fairgrounds, home to the Paulding County Fair. Held every summer, this fair is a showcase for local 4-H youth and their projects. Visitors to the fair enjoy exciting harness racing from the historic grandstand and fill themselves with all the delicacies that make up "fair food". 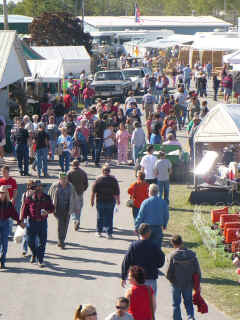 Fair goers enjoy a multitude of events from country and gospel music to demolition derbies and sanctioned rodeos. The Paulding County Fairgrounds is also home of the Flat Rock Creek Fall Festival, usually held the third weekend in September. This popular event draws over 25,000 visitors from around the country. Old fashioned is the theme... from a large display of steam-powered farm machinery and antique tractor pulls to weaving brooms, this festival is a feast for all senses. Grab a brat and a hot, buttery ear of corn and settle back and listen to blue grass during the day and 50s music at night. A flea market jammed pack with treasures and antiques provides a shopping Mecca for young and old alike. A national championship draft horse pull provides a deep appreciation for the term "horsepower". The Flat Rock Creek Fall Festival is not to be missed on your visit to the Village of Paulding. We invite you to come experience the Village of Paulding, Ohio and see what values, tradition, and family are all about. And, if you have a mind to , why don't you settle down here and call the Village of Paulding "home"?